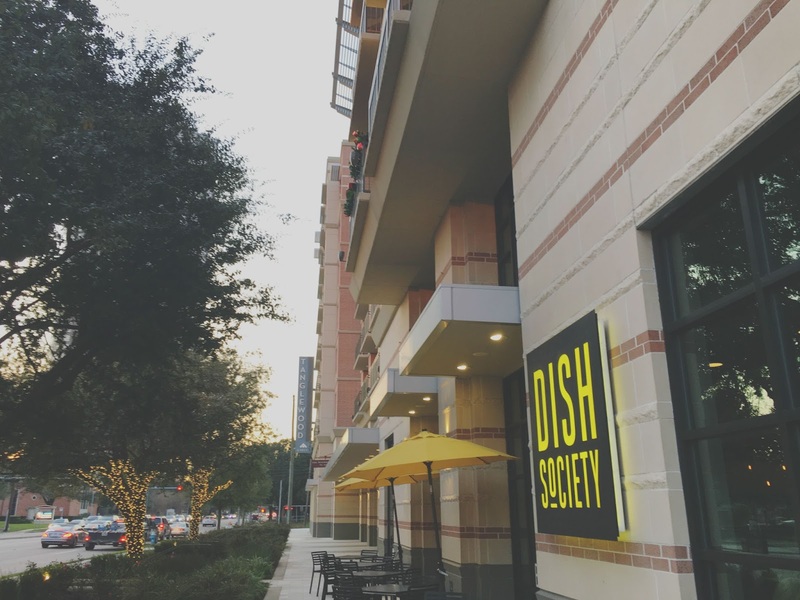 I visited Dish Society with the Houston Food Blogger Collective. All food and drinks were provided to me, free of charge. I was not monetarily compensated for writing this post. All opinions are completely, 100% my own! Life's about to get cray for me. I don't know about you all, but I was feeling very slumpy and "winter, boo you whore," and then this week seemed to kick off the busy-ness that's about to happen - which I'm excited about! On Tuesday we had our first Houston Livestock Show and Rodeo Wine Garden Committee meeting of 2016, and I'm super pumped, y'all. As of right now, I'll be working in the wine garden on March 2 (Chris Young), March 6 (Shawn Mendes), March 10 (Luke Bryan), Kenny Chesney (March 14), and March 18 (Little Big Town). So if you've bought your tickets yet for any of those dates, I hope you'll stop by and say hello! (and duh, drink wine). 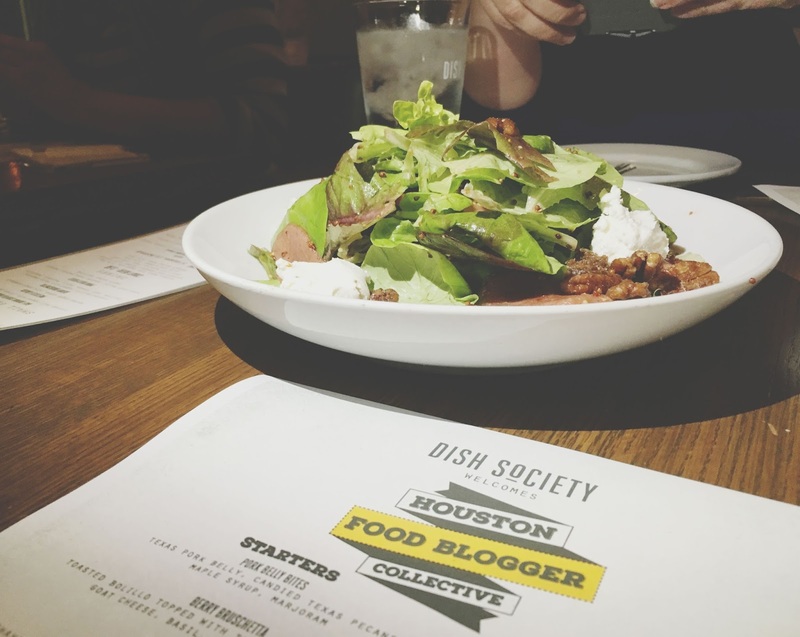 Then on Wednesday, the Houston Food Blogger Collective Executive Board and Advisory Council had its first meeting of 2016 at Dish Society, a restaurant located in Houston's Galleria area. And once again, I'm super excited about what's in store for the year! In a nutshell? Awesome food, more awesome food, and even more awesome food! (and duh, wine). Things are looking up, Houston snow birds! 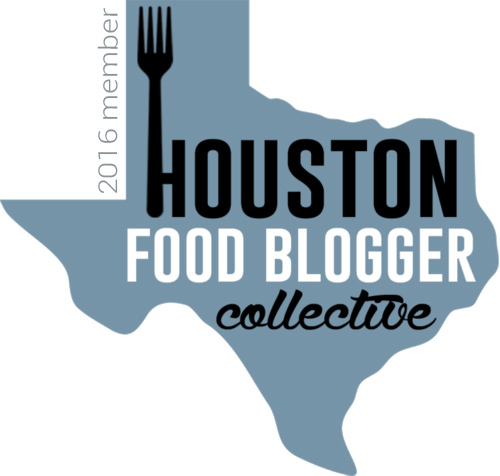 Other awesome Houston Food Blogger Collective board members there included Renia (Gristle & Gossip), Dalida (Brunch and Conversation), Julie (JulieJulez), Erika (Black Girls who Brunch), Stephanie (Copykat Recipes), Claire (The Petite Professional), Erin (Tidbits), Jay (The Fried Chicken Blog), and Morgan (The Foodie Chef). We put our heads together to start planning - and more importantly, start eating! That night we were sampling bites from the restaurant's winter menu. 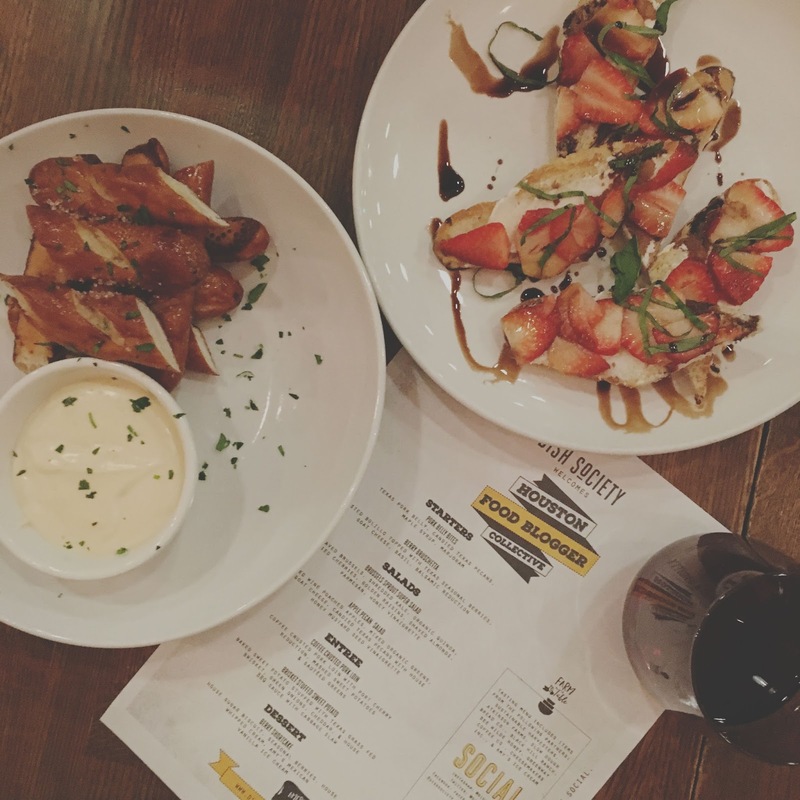 The appetizer round included pork belly bites and berry bruschetta. I also went rogue and ordered their pretzels and queso. You know, for the sake of research. Since I'm a vegetarian I didn't try the pork belly, but I did try the light and playful berry bruschetta! 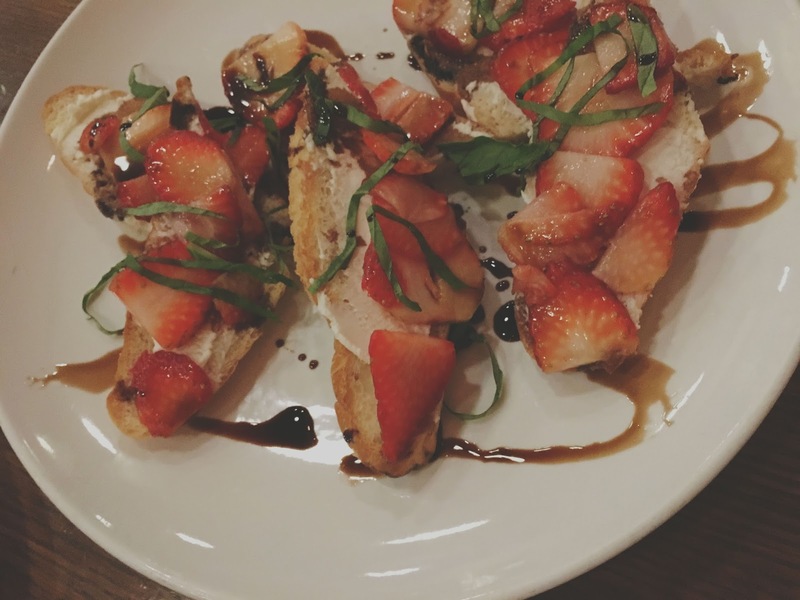 Toasted bolillo was topped with fresh Texas strawberries, creamy goat cheese, fragrant basil, and a balsamic reduction. The sweet/salty, berry/goat cheese combo was outstanding, but what really sealed the deal on this whole dish was the superfresh basil, which was borderline bitter - but in the absolute right way! The pretzels and queso dish was a major crowd pleaser, and was my favorite bite of the evening. 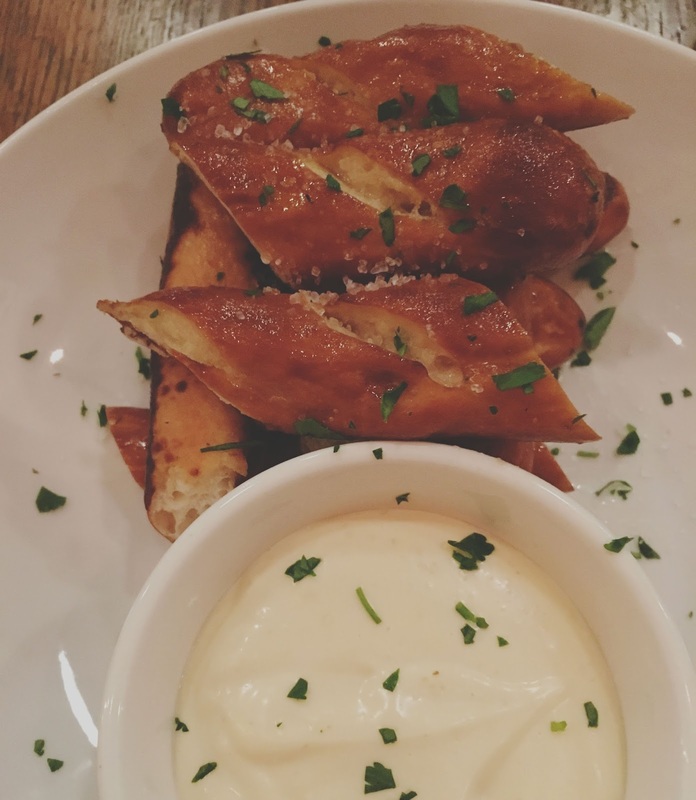 Firm, salty, slough dough pretzels were served alongside a rich, velvety smoked gouda queso dip. I've had multiple cheese/pretzel appetizers in Houston. I've had multiple good cheese/pretzel appetizers in Houston. And y'all? 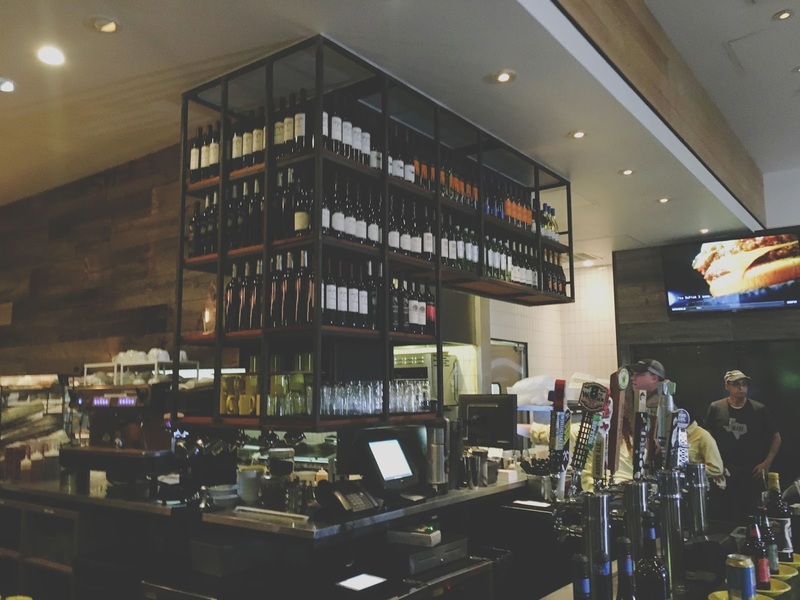 The one at Dish Society is far and away the best of them all! If you go (and you should! ), you've got to order it. You know, for research. 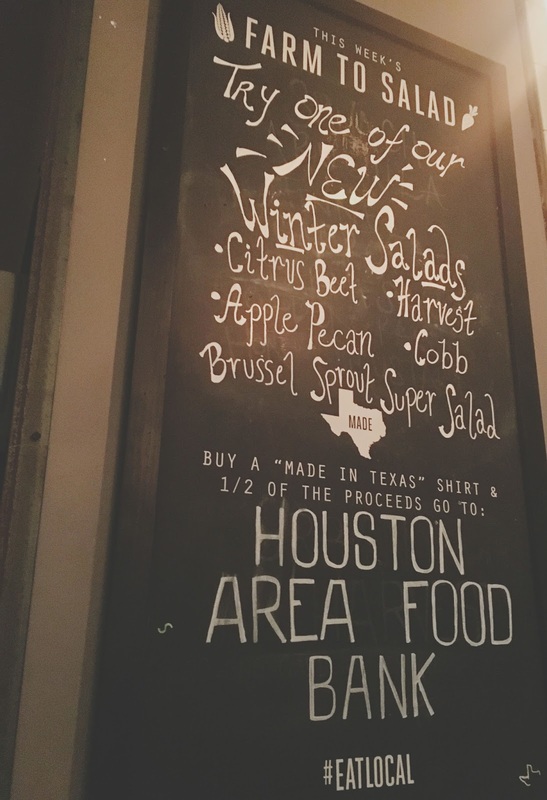 The salad portion of the restaurant's sampling menu included an apple pecan salad and a brussels sprout super salad. The apple pecan salad contained red wine poached apples, mixed organic greens, goat cheese, candied Texas pecans, and a honey mustard seed vinaigrette. If you are a fan of sweet fruity salads, this one is for you. I'm not generally a sweet fruity salad person, but the inclusion of that glorious goat cheese once again really sold me. It muted the sweetness enough for me to really dig in. The salad was given a great added layer of texture from the pecans. Overall, this was a nice, light salad. 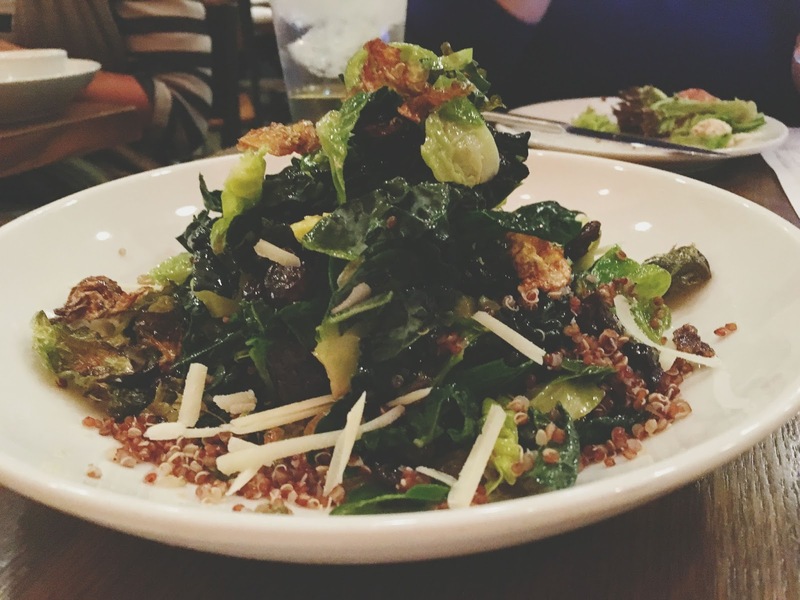 The brussels sprout super salad blew my mind. It was composed of shaved brussels, shredded kale (this, coming from a kale hater! Maybe I don't hate kale after all...? ), organic quinoa, dried cherries, golden raisins, shaved almonds, parmesan, and honey vinaigrette. The brussels sprouts were cooked so beautifully and had a wonderful smokey taste. The golden raisins were perfect little sweet morsels and complemented the sprouts wonderfully. Everything else in the salad served as a wonderful supporting cast of characters. 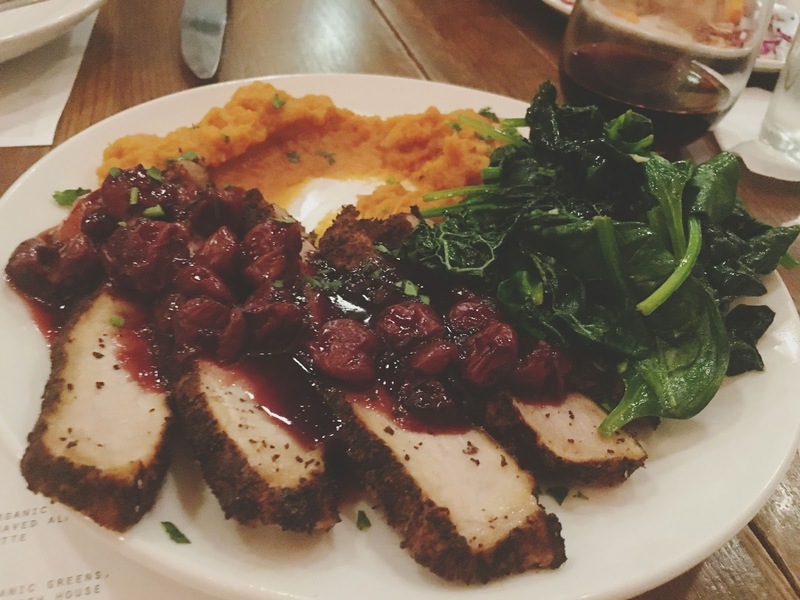 For the entree portion of the menu, they brought out coffee-crusted pork loin and brisket-stuffed sweet potato. 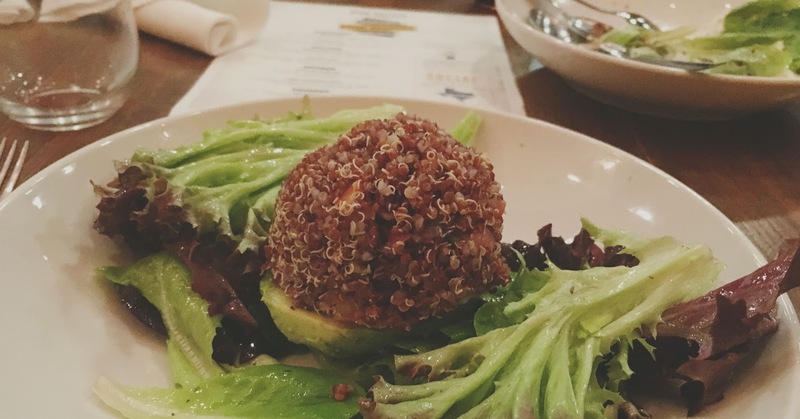 For obvious reasons, I went rogue again (you can't take me anywhere) and ordered the half portion of the quinoa-stuffed avocado, one of the restaurant's most popular food items. I took some of the pork home to Jon, and he was a big fan. 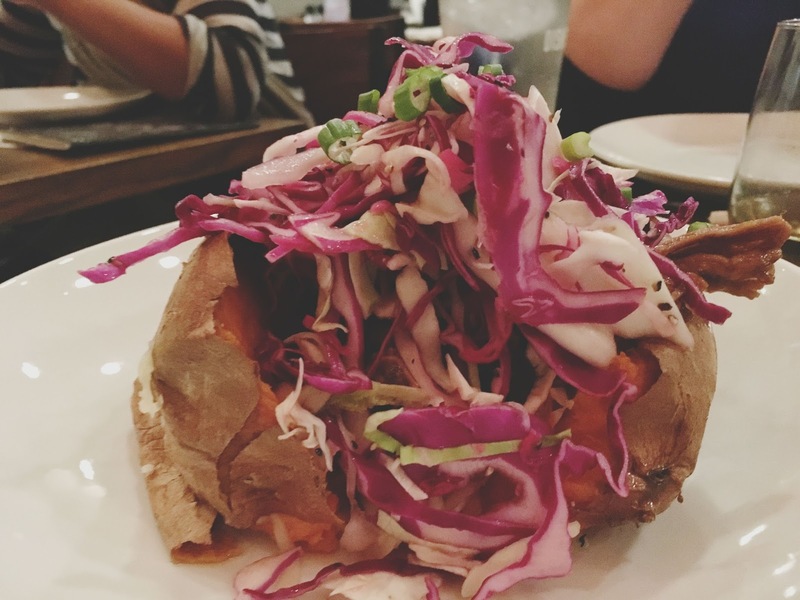 Also, everyone at the table appeared to fall in love with that brisket stuffed sweet potato (well, who wouldn't?). It did smell incredible. While the avocado stuffed with quinoa wasn't my favorite dish of the evening, it was certainly a good one. The quinoa had a light citrusy taste, with some crunchy veggies thrown in (onions? ), and the avocado was full and ripe. It was a very simple, healthy, and satisfying dish. For dessert, we were presented with the berry shortcake. This was one helluva knockout dessert! A flaky, sturdy, house sugar biscuit was topped off with fresh strawberries, house whipped cream, and Amy's Mexican vanilla ice cream. 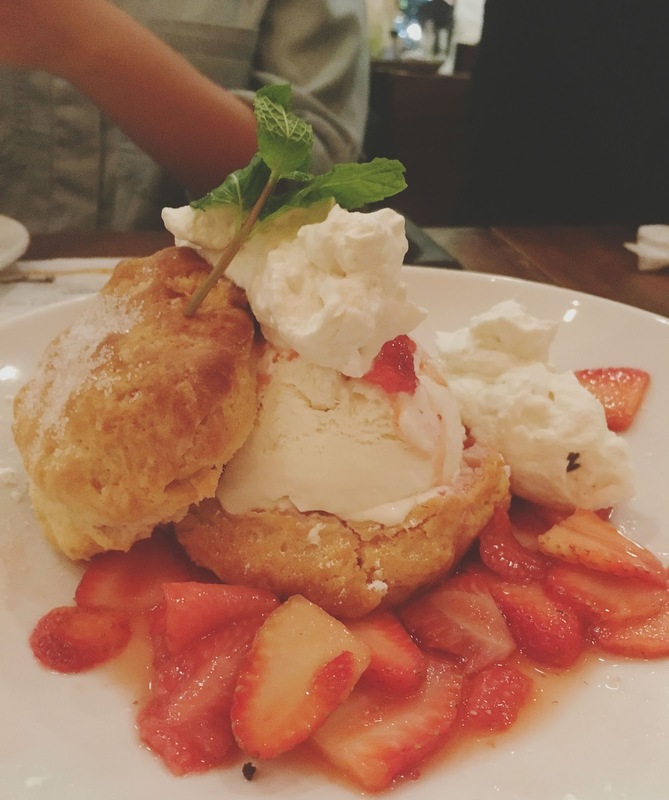 Julie claimed that this might be the best strawberry shortcake she's ever had, and I completely agree! The buttery biscuit balanced wonderfully with the other components of the dish. The end result was a light, flirty, and ethereal strawberry shortcake that I adored! 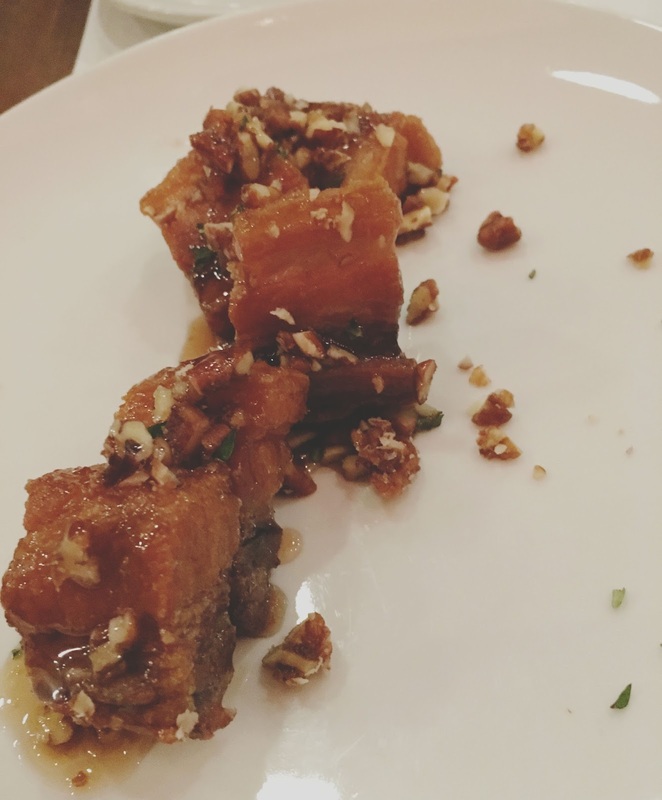 The food at Dish Society is local and fresh, and that is certainly apparent in every bite. 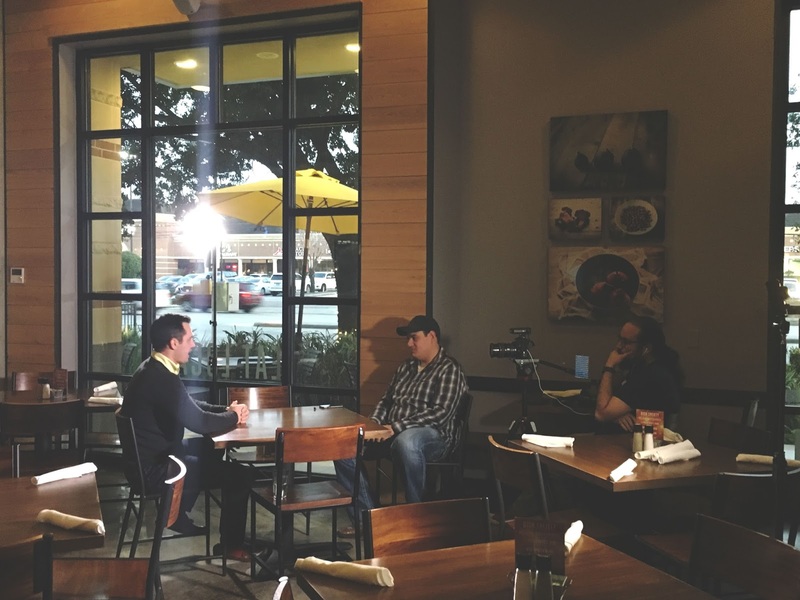 The restaurant's dishes are simple, yet manage to sit on a level above other similar food in Houston. I thoroughly enjoyed my visit, and I cannot wait to go back, whenever that might be!